Every response has turned wrong since the beginning of the civil war in Syria. Failure of diplomacy, failure of the UN. It's like Washington, London and Brussels watched from afar almost glad to see me destructions in the Middle East and now they want to look like the final heroes. Just hearing from Tony Blair is infuriating! Syrian state TV has shown a video of Bashar al-Assad arriving at work on Saturday morning after the coalition strikes. Syria’s air defence systems intercepted 71 out of 103 cruise missiles fired as part of the US-led strikes, according to the Russian military. Russian air defence systems did not respond to the missiles, it added. 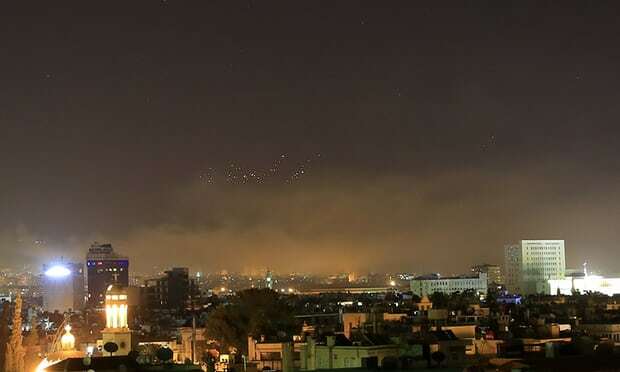 Turkey welcomed the attack, describing the raids as an “appropriate response” to the use of chemical weapons in Douma last Saturday. The French president, Emmanuel Macron, said the use of chemical weapons by the Syrian regime posed an “immediate danger for the Syrian people and our collective security”. The Labour leader, Jeremy Corbyn, has called the airstrikes “legally questionable” and said May should have sought prior parliamentary approval. The Nato secretary general Jens Stoltenberg has issued his support for strikes. The organisation’s main political decision-making body, the North Atlantic Council, was due to hold a meeting to discuss the developments on Saturday afternoon. The European Union and Canada have backed the strikes. The EU commission president, Jean-Claude Juncker, said those who rely on chemical warfare must be held to account. Hezbollah, which fights in support of Bashar al-Assad’s regime, said the US-led strikes “will not realise” America’s goals. The UN secretary general, António Guterres, has called for calm, urging “all member states to show restraint in these dangerous circumstances”.